Finally Friday! And the winner of this giveaway is the lovely Jennifer from the blog "I Know Right" Congratulations!! Thanks to everyone for participating on the giveaway! Stay tuned because there will be more giveaways very soon Yay!! Y la ganadora de este lindo premio es.....Jennifer del blog "I Know Right" Felicitaciones Jeniffer!!! Gracias a tod@s los que participaron y esten atent@s ya que se viene mas sorteos muy pronto siiii! Friends make life sweet and happy! I have different options for you, such as signed prints of this original illustration, or a customized version of it, banners for your blogs, avatars, etc. I'll be more than happy to receive your messages :) Thank you so very much and have a fabulous weekend! Mil gracias y que tengan un lindo fin de semana! Fabulous artwork. I love it. Giovanita, que talentosa eres <3 diseñas muy bonitooo <3 Una preguntita, esa bolsita donde estan los nombres, que linda con la muñequita...muestra! muestra! What a lovely illustration!! I'm so excited for you to do mine! I'll let you chose the pose or close up, I'm not sure what I will be using it for. Hope to have photos to you soon! You can see my new jacket on my blog now!! Oh, and before I forget, since I was a florist and wedding planner for 16 years, I'd like either a flower in my hair or tiny ones sprinkled, hum, or holding a flower?? Sorry, I'm going to let you be creative and make it how you want! I'm just super excited, you are so amazing and talented! Gorgeous illustration. I think it is one of my favorites! Y que tengan un lindo fin de semana!!! I adore your illustration...i am all about everything gypsy-bohemian!!! Beautiful picture!! ¡Para que luego digan que la amistad entre mujeres no es posible! Me encantó tu post y tu ilustración. Como siempre, claro. I must must must must must remember to email you about getting a new banner, I'm so forgetful but I'll do that today! Promise! I've moved to wordpress, just so you know, so I would love one of your designs for my new page. hey cutie! just wanted to stop in & wish you a MERRY MERRY HO HO!!! Hi! Nice blog. I very like it. to a fellow bohemian fashionista: you'll love it. Happiest of holidays my dear. Thank you for sharing your lovely illustration! This is a beautiful illustration. It is the epitome of friendship. 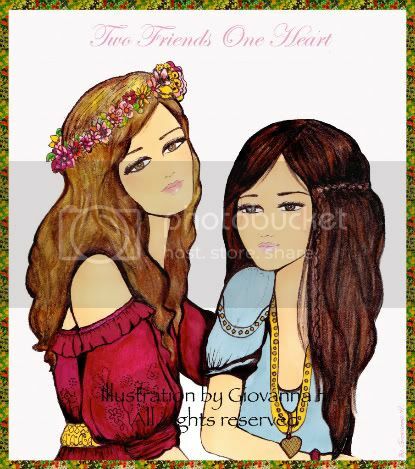 Beautiful colors and loving expressions make for a lovely and ethereal interpretation of true friendship. Have a great evening my dear. Holaaa GIOVANNA querida, gracias de verdad por tus comentarios, siempre pendiente y yo tambien aunque no lo creas pero solo que sin tiempo de comentar a nadie de mis blogs preferidos pero, como siempre tus diseños son tan profesionales para mi ya es un honor tenerte en mi lista buen incio de semana y ahora me doy un salto para ver el blog que nos recomiendas besitos!!! !